Somebody stop her! Here’s another paper out this week for Becky (http://stage.web.uoguelph.ca/abw/people/post-doctoral/). Meagher, R., Bechard, A., Palme, R., Dı ́ ez-Leo ́ n, M., Hunter, D. B. and Mason, G. 2012. Decreased litter size in inactive female mink (Neovison vison): Mediating variables and implications for overall productivity. Can. J. Anim. Sci. 92: 131􏰆141. Farmed mink vary dramatically in activity: very inactive individuals rarely leave the nest-box, while others spend hours active daily, often performing stereotypic behaviour (SB). SB typically correlates with increased reproductive output, and inactivity, with decreased output. Our objectives were to determine whether SB or inactivity best predicted litter size (LS), and to test three hypothesized reasons for inactive dams’ reduced LS: H1, excess fat; H2, chronic stress (potentially underlying inactivity because fear motivates hiding); and H3, health problems. We assessed time budgets pre- breeding, scored body condition visually, conducted health exams, and assessed stress using faecal cortisol metabolites (FCM) and ‘‘glove tests’’ for fear. Results did not support H2 and H3: inactive females were no more fearful than active females (P􏰋0.10), they excreted lower levels of FCM (P􏰊0.033), and were considered healthy. As predicted by H1, inactive females had higher body condition scores (PB0.0001), which predicted decreased LS (P􏰊0.040). However, path analysis determined this was unlikely to mediate the inactivity􏰆LS relationship. Compared with SB, inactivity more consistently predicted both LS (negatively, P50.038) and kit weight (positively, P50.037). Therefore, decreasing inactivity in farmed mink, rather than increasing their SB or decreasing their body condition should most improve productivity. The citation details are: Ethology 118 (2012) 543–554; and the abstract is below. This is Becky’s 5th paper, with two more in press and one currently under review; for more on Becky see… Ethology proved a great journal to deal with; speedy, with a very nicely laid out final product. Stable individual differences in activity levels within populations have been linked to differences in reproductive rate or parental care in several species, including American mink (Neovison vison). Fur-farmed mink are good models for studying such effects because they yield large sample sizes and readily allow investigations into maternal behaviour, reproductive success, offspring performance and the relationships between these factors. On farms, very inactive individuals generally have smaller litters, and this held true in our study populations. We tested two competing hypotheses to explain this: (1) inactive individuals are failing to cope with a challenging environment and experiencing chronic stress and ⁄ or depression-like ‘apathy’; this predicts female-skewed litters, poorer maternal care, higher infant mortality and poorer infant growth and (2) inactive individuals do not have reduced fitness but instead employ an alternative adaptive reproductive strategy, trading off offspring quantity for quality; this predicts enhanced maternal care, reduced infant mortality and enhanced infant growth. Inactive females’ kits, especially their sons, grew faster than active females’, even after statistically controlling for litter size; and by 21 d, inactive and active dams’ litters no longer differed in total biomass, despite the former’s smaller litter sizes. In kit retrieval tests, inactive females were faster than active dams to reach their sons (as well as more likely to contact their sons than their daughters: a bias towards male kits not evident in the active dams). Furthermore, kit growth rates and dam latencies to touch them co-varied, suggesting the existence of consistent differences in maternal style across inactive and active dams. Hypothesis 2 was thus supported: inactive females favour offspring quality over quantity, investing more resources in fewer kits, particularly males. This potentially boosts their sons’ adult fitness. More broadly for laboratory-based studies, possible ‘captivity effects’ on the fitness correlates of activity and other personality traits are discussed. 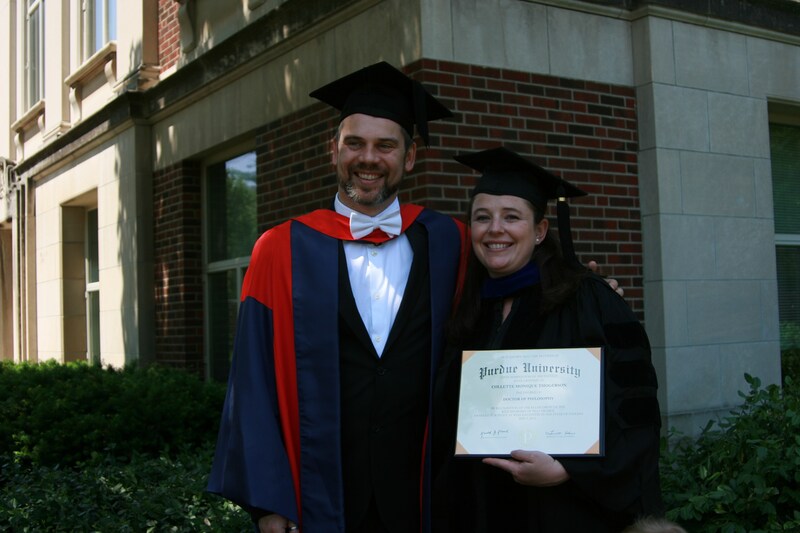 … Collette Thogerson, was awarded her PhD by Purdue University a few days ago. She’s my second ever academic grandchild to get a PhD AND I was on her committee too, so I’m doubly proud of her. Here she is, beaming, with her supervisor, the brilliant Joe Garner (http://med.stanford.edu/compmed/ research/garner_lab.html), who was my first ever PhD student, in Oxford, about 100 years ago…. This is a week late, but last Saturday Jamie (http://stage.web.uoguelph.ca/abw/ people/graduate_students/#Dallaire) presented his findings that levels of juvenile play in male mink predict their mating success 8 months later, in their first breeding season. This was at the OE3c (http://oe3c.mcmaster.ca/, a really great Ontario conference that’s held every year for graduates and post-docs working in ethology, ecology and evolution. Carole (Fureix) and I gatecrashed for just that session (scrupulously avoiding the coffee we’d not paid for in the break afterwards!) and really enjoyed it. A particularly nice talk (aside from Jamie’s of course) was given by Chelsea Kirk, who’s based in Bill Roberts’ lab at Western (https://sites.google.com/site/ robertsanimalcognition/lab) on information-seeking by lab rats: very cool stuff. Megan Jones, the PhD student I co-supervise in South Africa with Neville Pillay (http://www.wits.ac.za/academic/science/apes/staff/academicstaff/ pillay/7019/profnevillepillay.html) had her thesis approved today! It used the African striped mouse, Rhabdomys, as a model for understanding the developmental risk factors for stereotypic behaviour. One of the three examiners described it as “wonderful” and “an examplary piece of work”, while one of the others judged that “the thesis falls within the top 5% of PhD theses that I have examined or supervised”. Very nice: well done Megan!!!! !